James Edmund Loftin was the third child born to James Franklin Loftin and Frances "Franky" Elizabeth Fisher. James was born in 1853 in Catawba County. James' siblings were Harriett Jone Loftin, William Alexander Loftin, Mary Frances Loftin (not to be confused with Mary Frances Loftin, the daughter of William Alexander Loftin), Alonzo Loftin (not to be confused with Alonzo Lester Loftin or Alonzo Kelly Loftin), Washington Lafayette Loftin and Oliver Cromwell Loftin. 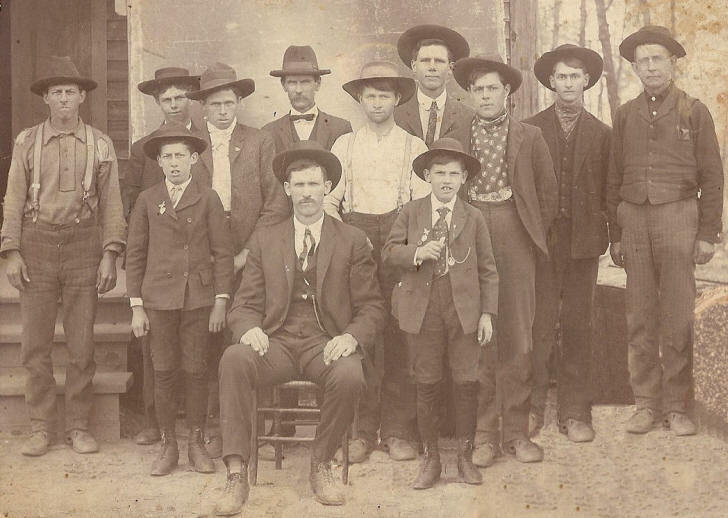 This photo of a group of men at the Shuford Gold Mine Store in the Bandys area of Catawba, NC, resurfaced after almost 100 years in 2009. Seated in the front center, Alonzo Lester Loftin, son of James Edmund Loftin's brother, William Alexander Loftin and Laura Cranford. Alonzo's brother, Garland, in also in the photo, standing 2nd from the right. Garland died in 1912, so the photo was more than likely taken around 1909 or 1910. When the photo was shown to Lois Loftin Mundy (b. 1908) in 2009, she said she believed the man standing in the back center of the photos was James Edmund Loftin, brother of William Alexander Loftin. The 1860 Catawba County Census shows James, age 7, living at home with his parents, (James) Franklin & Elizabeth, as well as his other five siblings. The family farm was worth a modest $600. James' father, James Franklin Loftin, was killed-in-action in 1864 during the Civil War. James would have been 11 years old at the time. According to the 1870 Catawba County Census, James Edmund was 16 years old and living with his mother and siblings in the Hamilton Township of Catawba Station. The family farm was now worth only $400. James Edmund married Susan Rebecca Jane McKinsey on 19 Dec 1872. Rebecca was the daughter of Robert & E. Meline McKinsey. James & Rebecca's marriage produced at least five children. Cerebral Hemorrhage Henry F. Rockett, Sr.
Rebecca Jane died somewhere before 1910 and James married Fannie (Unknown). According to the 1910 Catawba County Census, James and Fannie were living in Catawba Township with James' elderly mother, Elizabeth. 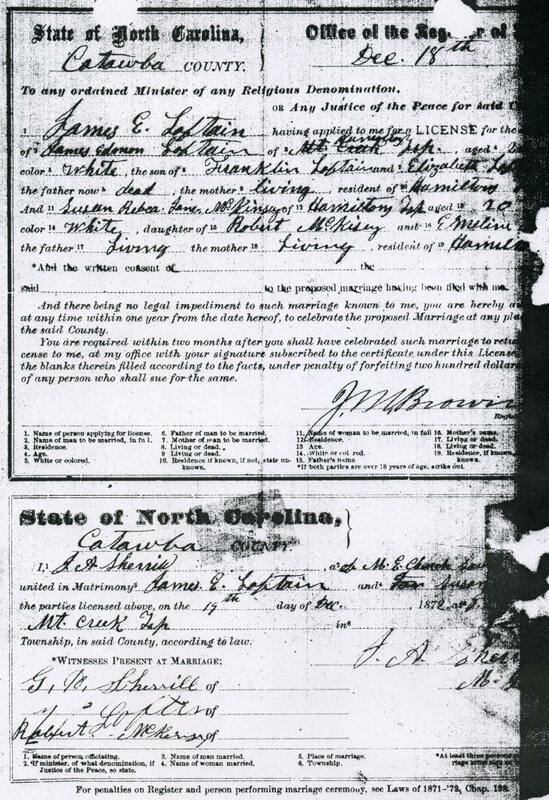 The Census shows that this was the second marriage for both James and Fannie. The Census also shows that Fannie had eleven children, but only five were still living. Fannie could not read or write. James' mother, Elizabeth, died 24 Jan 1918. The 1920 Census shows that he was living near his brother Alick (William Alexander Loftin) and Alick's second wife, Amanda Wanetta Beatty. Alick's daughter, Hattie Pearl, age 28, was still living at home. The Census listed James Edmund's wife as Mary and it should be noted that she could not read or write. It appears that Fannie (from the 1910 Census) and Mary (from the 1920 Census) were the same person. During an interview in August 2010, a 101-year-old Lois Loftin Mundy told Curtis Loftin and Peggy Brotherton that she remembered "Uncle Jim". She said she remembered him having a beard and how much he enjoyed drinking buttermilk. When he'd drink the buttermilk, it would get in his beard. James Edmund Loftin died 16 Nov 1925 as a result of "parenchymatous nephrites" or an inflammation of the kidneys - with heart disease also contributing to his death. 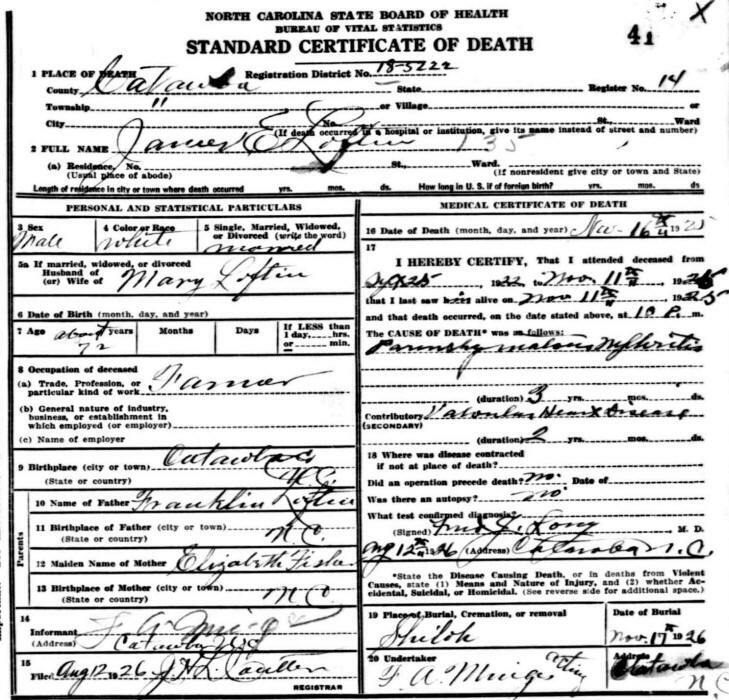 His Death Certificate lists his father as (James) Franklin Loftin and his mother as (Frances) Elizabeth Fisher. He was 72 at the time of his death.